Duncan Alan Mclean Germain (TK17) is an American traceur that established himself through the 3RUN and Parkour.NET communities as well as his videos. With the release of his personal sampler "Go", the first 3Run Family video, and parkour documentary, he has become a recognized athlete in his own right. Duncan's personal parkour sampler "Go" was released on November 26th, 2007. Upon viewing the first ninety seconds, a text describes the video's direction as well as Duncan's strict use of parkour-only movements. For two and a half years, Duncan dedicated his time to train for particular movements and to film on cloudy days while wearing a black Harry Potter jacket, a pair of jeans, glasses, and FiveTens. To this day, "Go" is often referenced for its pure parkour movement, great editing, and the "look" of the video's athlete. 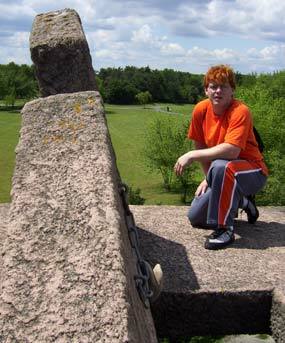 Duncan is about fifteen stones which is bigger than the typical traceur. Many people ask whether or not weight matters and Duncan was able to show that heavier athletes can still accomplish fantastic feats by putting forth the effort. It is also often asked online whether or not jeans and glasses should be worn; Duncan showed that apparel clearly does not define a traceur's movement. Scenes were filmed from all around North Carolina (Burlington, Chapel Hill, Durham, Elon, Greensboro, Raleigh). "Pilgrimage" documents the athlete's journey back to the discipline's roots in France. With help from the international scene, Germain gathered enough footage to describe the "pilgrimage" that many athletes take each year. Duncan also took a trip to France in the summer of 2007 with friends to film. Before the project was released, TK17 was able to meet up with David Belle in March 2008 to receive his permission. On March 23rd, 2008, the documentary was released on several forums under the username "Ender Wiggin", Duncan's personal role model from Ender's Game. Since the release, dozens of athletes have referenced "Pilgrimage" as a resource to travel to the birthplaces of parkour. "One" ("loin de la perfection" / "far from perfection"), originally released on August 1, 2010, marks Duncan's return to parkour after a long-lasting injury. The video is all from a continuous shot, filmed in one take with a headcam. It follows Duncan on a single route through Lisses, ending with a climb to the summit of the Dame du Lac. Duncan Germain has been recovering from a bad fall that occurred late September 2008. Many were shocked to find that he deleted his 3Run forum account as well as his YouTube account. Apparently, he disconnected from all online parkour communities including his local community, NCParkour. This page was last modified on 27 February 2011, at 22:21.